Energized by the classic cosmic music of the 1970s, synthesists in the USA have been making significant world-class contributions to the community for many years. Dweller at the Threshold is one of several such groups spread thinly across North America. Inspired by the electronic music movement of pre-ambient/techno Europe, Dweller at the Threshold grew out of a fascination with the ability of electronic music to facilitate a cinematic yet personal experience in sound. To DatT, the synthesizer is the ultimate creative tool, offering a versatile palette of contrasting textures animated by hands-on manipulation. Present within their music are the syncopated electronic rhythms, haunting melodic lead lines and unearthly morphing atmospheres found in good spacemusic, but DatT's effect is off-center enough to give the attentive listener a refreshing pause. This unique approach to music and technology allows DatT to produce realizations that are distinctly their own. They capture the mood of this bygone era without becoming cliched and explore this expansive realm while retaining their own true voice. At the center of DatT's evolving and revolving cast of musicians is Dave Fulton. Fulton works with modular synthesizers, synths whose virtues are: no presets, no memory, no hard wiring and no boundaries in programming flexibility. Part mad scientist, part sonic visionary, Fulton's command of the array of custom designed electronics at his disposal is formidable. 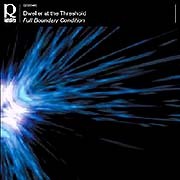 The Full Boundary Condition is a triple CD set which includes remastered versions of the first two Dweller at the Threshold albums: No Boundary Condition and Generation Transmission Illumination, as well as a third disc compiling sections from their 28 July 2001 live performance at The Old Church in Portland, Oregon and recordings taken from this concert's practice sessions. This disc (65'32"), after which this 3CD set is named, is characterized by improvised passages of deep electro-ambient soundworlds and ethereal interstellar spacescapes which resolve into full-blooded sequencer studies intertwined with ribbons of warm synthesizer melodies. The Full Boundary Condition is the result of a search through the sonic expanse of the musician's mind via the synthesizer. The meaning of this music remaining hidden somewhere within itself.